You’ll be hooked, I tell you. Once you learn how to bottle your own meats, you’ll never go back to the old way of doing it. Think about your meat habits. Do you put up a 1/2 beef in your freezer every year? Do you buy fresh from the butcher and take it home to prepare? Do you buy in bulk and freeze what you aren’t using right away? Do you buy canned meats? All of these practices have their own pros and cons. Today I’m going to share with you my top reasons for learning to can, or bottle, your own meats, and if you give it a try, your life will never be the same. For most people, freezer space is at a premium and often, it’s frozen meat that takes up most of the space. If we can get those meats out of that precious space and into a canning jar on a shelf then that space can be much better utilized for things like ice cream and otter pops. You know, the important stuff. When we see a great ‘do-not-pass-up’ deal on meats, we’re able to take advantage of it by home-canning the meat. Buying a variety of meats on sale and then canning it means you and your family won’t have to eat the same meats again and again just to use it up before it gets freezer burn. In our everyday, non-emergency lives, we have fuel. We cook, heat and cool with it all the time and don’t think much about it. Many people have an emergency plan for power outages and figure they’ll just pull out the camp stove, propane, and then either cook or home can all the meat in the freezer at that point. I’m here to tell you that when things go crazy, there will be much more to worry about than canning your thawing meats. Why not take care of it now when you have the time, readily available fuel and energy to get it done? When you home can meat there are no hidden ingredients. You know exactly what goes in is what comes out. No artificial anything unless you are into that sort of thing. Then by all means, add those artificial ingredients! Cooking during a power outage is so simple with home-canned meats. They are already completely cooked through so we just add them to whatever recipe we are throwing together and heat it up. No extended cooking times, which use up precious alternative fuels. Another option is to drain the meat and then use it in something like chicken salad, a family favorite. Canned meats are expensive. Where I live a small tuna-sized can of chicken, 10 ounces, is about $3. With my large family, a meal gets pretty pricey buying canned meats, but I can bottle a whole quart (2 lbs) of chicken for about $3.00. I buy my chicken in bulk for less than $2 per pound, sometimes way less. Then I’m always eating sale price chicken. With the meats thoroughly cooked by home canning, we’ve eliminated a lot of the time involved with meal prep. It does take time to can the meats but that’s a concentrated and efficient amount of time that is scheduled for another day. At dinner time I can pop open a can of cooked chicken or ground beef, and that makes recipe prep SO much easier and quicker. I’m not much into advance planning when it comes to daily meal times, but I’m working on that with this plan for menu planning. With all our meat kept in the freezer, I have to think at least 8-10 hours ahead — know what I’m making ahead of time and making sure the meat or chicken is thawed out in time. Often, I get busy and right around 5 p.m. start panicking because nothing is thawed out. At times like this, I can open a can of canned meats and have a meal on the table in about 20 minutes because all I have to do is assemble and heat it through. Okay, we’re not really saving the planet, but canning jars are reusable so at least we’re not contributing to the landfill by using cans. When you first begin home canning food, there is a little bit of an investment to get started if you buy new jars and lids, but they can also be found at yard-sales, thrift stores, or just ask around your neighborhood. You might find an elderly neighbor who is happy to pass along their bottles to someone who will put them to good use. Canning jars come in all sizes. Use the size that your family will eat in one meal. At my house we use both quarts and pints for chicken and beef because sometimes the meal will be for all of us and sometimes the kids are off doing kid stuff and it’s just mom dad and the littles at home. In a world where we can hire almost everything out, there is something to be said for the satisfaction of doing it ourselves. Self-reliance in skills and knowledge brings a peace that cannot come any other way. Providing for our families is our number one job and doing it well is a wonderful thing. I would love to can more meat. However, hubby refuses to even try home canned meat. He insists that he knows that it tastes like dog food. Sigh! I had canned some chicken, and he threw it away when I was at work one day. He claimed it looked like it had gone bad. Grrrr! #3 is a good point. A Sarajevo siege survivor told me that one of the first things you miss is your stove. I actually heard somebody once say that you can still run your canner on a campfire. Good luck with that. Did you want to link to something that tells us *how* to safely can meat? I think that’s the main obstacle for most–we’ve all heard it’s dangerous, have to use a pressure canner, etc. I just read your blog and will be trying that in August (when the last of the “summer” parties are over and the canning season will be underway). But, having NEVER canned meat, can you tell us canning newbies what to expect, taste wise, and since the meat is cooked, what can I do with a quart jar of cooked steak cubes when my family LOVES grilled steak or pan fried steak? Beef stew comes to mind, but I hate to explain to grill happy men folk that stew is about all I know of to use it for. I bought some canned chicken from a national brand. We opened the can and made the recipe as it was written. We thought it stunk! I don’t want to can my own chicken and end up having it taste like chicken I could have bought (and hated) from the store. Great article! I’m going to plunge in and try this in a couple weeks. The Zaycon link does not work, unfortunately. The requested URL /refer/zf9485 was not found on this server. Try this one, https://www.zayconfoods.com/refer/zf9485. If it doesn’t work, I’ll have to let Zaycon know there’s a problem. Ann Marie, The link in the article is an automatic link. Sorry about that. The company is Zaycon Foods. You can find them at http://zayconfoods.com They advertise through word of mouth because that’s the best kind of advertising. I know that Lisa has put her referral link out in the past. If you love the service and tell your friends and if they end up making a purchase, you earn a $1 credit on your next purchase….making your meat even less expensive. Yea for inexpensive quality meat! I am hooked on canning meat and not afraid to admit it. I just canned 26 pints of chicken for $1.57 each. I had room for 4 more jars so threw in 4 pints of ground beef. First time for ground beef so looking forward to how it tastes. I canned pork for the first time last week and it is amazing! Made the best pulled pork. I have canned meats for years. Try turkey – no more tasteless, dry bird! One thing, you have to cut off the bottom of the legs. Get a cheap hacksaw & keep it for kitchen use. Hey guys, just p/u 40 lbs of chopped beef (93.7% lean) n am canning 1/2 n freezing the rest. Giving to kids. Now I’m getting chick. breast @great price in Oct. n doing the same. Survival Mom, I can’t thank u enough for ur step by step with canning. I’m totally addicted. But guys, Zaycon is a great co. N they have more than meat n all in bulk @great prices. Happy Canning!!! I am hooked on canning meat too! It is fabulous! I feel sorry for the lady who husband won’t try it. To say home canned meat taste like dog food….well, he has never tried it! I have canned barbqued pulled pork, pork chops in mushroom gravy and plain seasoned country ribs, chicken breasts and thighs, tons of corned beef, bacon, ground beef and pot roast. It comes out so tender and flavorful that you can’t tell it was canned! We started canning meat last October and it has been a blessing to be able to grab a jar from the pantry and put dinner on the table in just few minutes! Tonight after work and working on stuff for upcoming events for our concession business, I made homemade Shepherds Pie in about 20 min… start to finish! I used home canned beef cubes in their own broth, home canned mixed veggies canned in water (carrots, celery, onions, corn and garlic), a couple of packets of onion gravy mix, and instant mashed potatoes. I topped it with some cheese and made some canned biscuits. Dinner done, hubby happy and I’m outta the kitchen on a hot day in record time! We have done beef, chicken, pork and bacon. Along with soups, stews, chili’s, veggies, jellies, jams, pickles and more! What a huge time and money saver! For canning instructions for meat , http://www.pickyourown.org. You will also find instructions for canning just about anything with step by step pictures. Try using caned beef for chili,beef and gravy either over noodles or rice,taco’s,barbecue beef sandwiches ect. Just about anything you can us ground beef for will work. As for chicken see above. Don’t know what you tried cooking with the store bought chicken and while I have some in my storage I have never used it. Chicken and dumplings come to mid when I first think of canned chicken. I can beef,chicken,turkey,ham. ham is great to use in the crock pot with beans,potatoes,split peas ect. At Thanksgiving and Christmas time both turkey and have are on sale and I can enough at that time for the year. I purchase Tyson whole chicken at the PX for $.89 a lb. I place 5 chickens in my big stock pot, cover with water, cook for 40 minutes. Take out the chicken, let it cool, and debone it. Then process the chicken, and that wonderful broth that the chicken cooked in, for 90 minutes in a pressure cooker. I value the broth about as much as I value the chicken. My husband laughed at me the first time I pressure canned. I put the weight on, ran out and stood at the kitchen door for about 15 minutes. Looking forward to trying to can meat. The owner of my CSA cans her meat in the garage on a butane turkey fryer set up. She said as long as your not an idiot and crank it all the way up your should be fine. She does 40 pounds of chicken at a time. Maybe I missed it but do you put any liquid in the jars with the chicken before canning? I’ve been canning 99¢/lb chicken thighs with my DIL as a way to teach her, help her save money and time. She has more recipes than I with which to use the quarts and pint-and-a-halves. (To feed her family of 6) We skin the thighs, cook the thighs about halfway, and stuff about 5 thighs per quart, plus the broth they were cooked in. Process for 90 minutes at the right pressure for our elevation (I’m about 2300 ft above her). The thighs are far more flavorful and tender than the commercially canned chicken breasts. I also pressure can chili con carne, spaghetti sauce, zucchini-basil soup, butternut soup, bacon, and green beans, in my 23 qt. Presto. I was inspired to start by Kathy Harrison’s Just in Case book of several years ago. A fun and productive way to enhance a friendship. I tried canning chicken this weekend for the first time. (2nd time using my pressure canner). I was impressed with myself. LOL 6 quarts of canned chicken I used homemade stock and raw packed the chicken thighs. I am going to do more since chicken is still on sale. I am also going to try my hand at beef stew. I am so geeked. I tried canning bacon after reading directions to lay out the strips on wax paper, stuff them in the jar and then pressure can it for 90 minutes at 10 lbs of pressure. I ended up with a slimy glob of goo not even the dog would eat – and he eats dirt, bugs and moldy poop. Nothing worked to crisp that icky mess up, either. Broiling just burned it, baking didn’t faze it and frying was a similar failure. Anybody have directions they could share about how to can bacon so it turns out? I signed up for Zaycon because it sounds pretty good. The chicken breast for my area is 2.49. Does that sound about right? You talked about under 2$ so I was just curious. These ideas are great thanks for posting. It’s gone up for me too Deanna. We got an email a couple of weeks ago from Zaycon about the price increase. I’ll include that below so you can get an idea of what is coming down the pipe. Email text from Zaycon explaining the price increase. “This is not the usual email from Zaycon Foods – this is what it looks like when a company is honest with its customers. Please take a minute to read this message; it affects all of us. We are seeing truly unprecedented circumstances in the protein commodity markets this fall; in fact, they are turned upside down. You can see it on the news, in stories online and in print, or simply by checking meat prices at your local grocery store: the extremely short supplies in the beef and pork markets have now pushed into the chicken market, and demand for chicken is up more than 17% nationwide. This squeeze on the market has not merely reduced supply, it has completely changed production forecasts, impacting the production ability of suppliers of beef, pork, and chicken products. These unforeseen circumstances have caused a marked shift in the availability of products this fall. Zaycon is committed to getting you quality foods at the lowest prices possible. There’s no trick to how we keep pricing so low: we give you the best prices the going market rates allow. And we always try to secure as much inventory as our customers want. As our events near the point of selling out, usually we just order more truckloads from our suppliers. This fall, the inventory is simply not there. Given the reality of current supply circumstances, we simply must raise the price of our chicken to $2.49 per pound. This is, in all honesty, the smallest increase we can possibly make without actually losing money on this sale. And there’s more: given the strained supply of chicken available right now, we must move the deliveries scheduled to start in early October to the end of the month. To be very clear, all past sales will be honored at the price you paid: if you have already ordered your cases of chicken, your event’s date is moving, but your price will not. The new pricing only affects future orders. Please know that we are working hard to minimize the impact this change will have on you: your deliveries will occur at the same locations and on the same days of the week, but with the dates moved approximately three weeks later. We will send details about these adjustments soon; please stay tuned to your email, texts, and our Facebook page for updates. Also, for the record: once we can lower pricing again, we’ll do it. Do you can meats raw only or can they be cooked first? I know meats are cooked during the canning process, so would it taste bad or ruin the nutrients in the meat if they were to already be cooked and then canned? 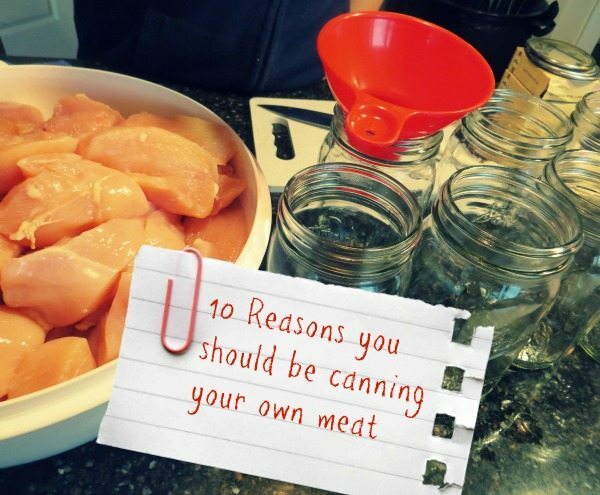 For the article I was talking a mostly about raw pack canning but you certainly can precook your meats as well. For chicken pre-cooking gives it a nice golden color and the chunks are not so attached to each other. I always precook my ground meats because it’s just more appealing to me that way. I do add beef broth to the ground meats before processing but for raw pack I don’t add any liquid and the jars come out full of stock. When I do bacon, it gets partially cooked in the oven then laid on parchment paper, folded to jar height and rolled up before putting it in the bottle for processing. It’s mostly a matter of preference. What is the difference between a pressure cooker and a pressure canner? The difference between a pressure scanner and pressure cooker is the size. Scanners hold quart size jars, cookers are for cooking beans, meat, etc. I had a small scanner/cooker but got a larger scanner because it took too long to can all my veggies and deer meat in the smaller o e. If you’ve never canned, I recommend going to your county extension service for instruction. I just used the link in the post for Zaycon Foods but I have a couple questions that I could not find the answers to, so maybe you can help? 1. Is the meat organic? 2. Do you have to wait till certain products are offered at an event in your area before you can order it? Do you know how often they deliver to each area? Lisa, have you personally ordered from this company and were you pleased with the taste and condition of the food ? For me finding this link came at the right time, I have been looking for a source I could purchase in bulk rather than the local grocery store. For those that have not tried canning – don’t wait if I can you can! I live in hurricane county and I try to keep canned food on hand all year – but I try to have the freezer close to empty or with frozen water and use it as just a hold over area till I can can the food. Cathie, as far as I know, the meat is not organic. The Zaycon website says that there are no added hormones, artificial ingredients, or additives. The chicken breasts are HUGE and excellent. I used to buy frozen turkey breasts from Costco and these are at least twice the size. They look and smell very fresh. I’ve also purchased Zaycon bacon. It was a little too fatty for me, but I usually buy the really expensive, meaty bacon, which isn’t all that often. My family thought the bacon was fine. You are probably on their email list for notices, but you can check in every so often to see what they have available. Usually, their pick up location is in a church parking lot. Hope this helps! I really do like being able to buy a large amount at once. Their ground beef is next on my list to try. I checked the FB page and they have quite a few likes, seems to be a popular company. I have the ground beef and ham on order for next month. So I have to check my canning supplies and get things ready for a few canning nights. I would like to get the chicken breast and maybe the bacon next if it is on my event. Thanks again for the reply and the link. I’m in love with canning Zaycon Chicken. I’ve done it for 2 years now. It makes dinners so easy, and all I add is a little bit of salt. So I know it’s healthy. I just bought a bunch of pork tenderloins from Costco at a good price and plan to can it tomorrow. I’m interested to see how the pork compares to canned chicken. I realize the comments are as if this were published years ago, but today, the article talks about chicken for ninety-nine cents and a link is provided. I went there and I don’t see anything at such a low price. Is this offer from an old version of this article, or is it actually a new article and the date displayed at the top of it is accurate? Sorry, I’ve never tried to utilize an offer from your site before! Thank you! You’ll need coupon code CHICKEN2018. 🙂 Try again. I’ll add that to the blog article. For a flavor twist, before you cut your beef into strips or chunks to can, sear it on a grill. Then cut up and can. When opened it will have a hit of grill flavor that is great. We’ve used our canned meats in stews, soups, over rice, with noodles, chicken salad, ground beef in any recipe called for cooked hamburger, etc. Only seasoning I add is some granulated bouillon to the large stock pot that I partially cook my meat before canning. I do cook my hamburger meat done with onion. I do not recommend adding salt (even though some canning books suggest it) as we found that canning seems to concentrate it and makes the meat almost inedible. My grandmother used to can meat but I recommend you use the times and pressures in the modern canning books for safety sake. The coupon code isn’t working. I know this is an old post but I hate the taste and the texture of canned meat. Chicken is the worst.i have done lots of beef, pork, and chicken. It is always dry. You can taste that it is canned in the recipe. Just not sure if it would be worth it for me to can and then not use it. Heidi, I’ve been canning me eat (beef, chicken, pork, and corned bf brisket). Iboil all my meat till almost done in broth using appropriate bouillon. The pack meat in same broth that I boiled it in and rarely have it taste dry. It’s full of flavor. Bouillon is the only thing I add to meat when I boil it and no added salt when I jar it for pressure cooker. We love it for everything.